Amanda Doherty had just gotten back to her hotel in Ormond Beach, Fla., when she fielded the phone call from Augusta. It was a short one because, well, how much deliberating is there to do when there’s an opportunity to compete at Augusta National? With that phone call, Doherty, at No. 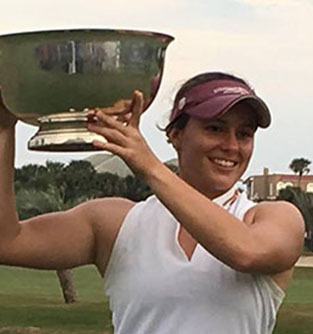 104 in the World Amateur Golf Ranking, became the highest-ranked player to score an invitation to the Augusta National Women's Amateur through her world ranking. She was halfway through her romp to victory at the Sally Amateur when her position in the field became final, which is to say her ranking will improve before the event in April. Before last week, however, she had resigned herself to the fact that it might not happen this year. Doherty, being a native of Georgia, knows better than some what Augusta fever is like. She’s only been to the Masters once, as an 11-year-old in 2010, but remembers sitting with her family on No. 15 green on Sunday afternoon taking it all in. The Dohertys walked most of the course that day. The historic event will draw plenty of eyes. For one thing, it will be broadcast on NBC Sports for three hours during the final round. That's unheard of at this level. A rough view of the field began to take shape over the past two weeks as players tweeted pictures of their invitations. Some, like Erica Shepherd, attached photos of themselves as youngsters, driving home the point that the creation of the event last April surpassed their wildest dreams. “Have always dreamed of playing at Augusta National... and now that has become a reality,” Shepherd said in that Jan. 10 tweet. There are a few holes and a few question marks still on the field list, including one of the latter beside Lucy Li’s name. Li, a 16-year-old U.S. Curtis Cupper, is the subject of a USGA investigation after her appearance in an Apple Watch commercial potentially compromised her amateur status. News of the investigation broke Jan. 5, days after Li had tweeted a link to the commercial (in which she is featured prominently, including on the golf course), but the USGA has yet to reach a decision. When asked for an update on the investigation (during a Latin America Amateur press conference on Jan. 17), Mike Davis had no news to give. "There's precedent on this, so we're in the fact-finding mode,” he said. As for the holes, well those are mostly near the top of the WAGR. World No. 1 Lilia Vu, a UCLA senior, is not on the list, having already announced she would turn professional this spring and make use of the LPGA card she earned at the LPGA Q-Series in November. Also missing from the confirmed entry list: Patty Tavatanakit (No. 3), Frida Kinhult (No. 6), Albane Valenzuela (No. 7), Rachel Heck (No. 11), Yealimi Noh (No. 14), Mariel Galdiano (No. 15), Yujeong Son (No. 24), Dewi Weber (No. 31) and Elizabeth Wang (No. 54). Noh has voiced intentions to forego college and turn professional in the coming months, but did not give a timeline for that decision. Son told AmateurGolf.com on Tuesday that she had already turned professional. Weber, who spent the last three years on the University of Miami roster, earned LPGA status by reaching Q-Series. She graduated in December and has turned professional. Then there’s the ANA Inspiration. It's the LPGA’s first major and it overlaps the ANWA. Traditionally, tournament organizers have supported the amateur game by granting exemptions to top female amateurs. Seven amateurs were in the field last year. The ANA’s amateur invitees have not been announced. The Florida State freshman from Fiskebackskil, Sweden, received a call from an ANA tournament official last week with the offer. It was a position she didn’t expect to be in. “I want to do them both so badly but sometimes you have to choose between two great things,” Kinhult said. She put it in the Kinhult family group chat but with her parents at a wedding back home in Sweden on Friday night, had to put the conversation on hold. She went to bed that night with her phone on, and received a call at 4 a.m. Her brother Marcus, playing in the European Tour’s Championship over the weekend, also chimed in the next morning. Florida State head coach Amy Bond had given her blessing either way, and ultimately Kinhult chose the ANA. Plus, Kinhult reasoned, if she remains an amateur, the Augusta opportunity might present itself again in a year whereas the ANA opportunity might not. Now that Augusta is on the table for female amateurs, it isn't going anywhere.